We all know it’s good to keep a clean house no matter the time of year. This is especially important in Japan once rainy season kicks into high gear—mildew and mold can spring up before you know it! But the best offense is a good defense, and a little preparation can make keeping your home clean a breeze during rainy season. There’s a sweet spot in between winter and spring—once the winter air warms up but before the strong spring winds begin to blow—that’s the perfect time to air out your house. Rainy season is especially humid, so good circulation can help prevent stagnant, moist air (which can cause mold and mildew to grow) from sticking around. Open some windows on opposite sides of your home when the weather permits so a nice breeze can pass through. Under the sink or in the pantry, inside your dresser and closet—there are a lot of problem storage areas that can accumulate moisture and mustiness right under your nose. Take some time to go through these areas and take stock of the situation—separate the things you don’t use or don’t need from essentials for the coming months. Be sure to dust as well, since excess dust can become a food source for mold! Commonly used kitchen items like wood-handled knives, wooden cutting boards, sponges or kitchen towels are all prime places for mold and mildew. Be sure to give them thorough, regular cleanings with a disinfectant—and make sure that they dry completely! For things like sponges and towels, it might be a good idea to get some new ones if they’re past their prime. If you want to prevent mustiness or pesky insects from snacking on your wardrobe, you have to keep it clean. Clothes you won’t use anymore—like heavier coats, sweaters and scarves—should all be laundered and stored in a cool, dry area. Make sure cold weather boots, hats or bags are dry before you put them away for next winter. It’s easy to forget about some of the larger fabric items in a home. Things like curtains, couch covers and house mats could all use laundering as well. Make sure that you air out your futon if you have one—it’s very common for Japanese households to hang their futon with their laundry when the weather allows. It’s also good to swap out your heavy bedding for lighter, more seasonally-appropriate blankets and sheets. You’ll feel more comfortable while you rest, and they’ll absorb less moisture! In Japan rainy season is when things really start to warm up, and right around the time pests like to get into the house and lay eggs in your clothing and carpets. There are gentle repellents or pesticides that can be stored with clothing to help prevent these buggers from setting up shop in your closet or drawers and snacking on your clothes. Many Japanese houses and apartments also have ventilation or fans that lead outdoors. A cloth or mesh cover can make it harder for insects to get inside. Even the latest models of Japanese washing machines can provide a good environment for the growth of mold and mildew. Daily use leaves behind a lot of moisture, and the same grime you wash off your clothes can be tasty food for bacteria. Routine use of specialty cleaners can disinfect the tub of your washing machine and help safeguard against that. Similarly, regularly cleaning and disinfecting household sinks will prevent the same problem from arising in your drains, and also ensure that there aren’t any unpleasant odors hanging around. Using a water resistant spray on your shoes, bags, umbrella or other rain goods can be a real lifesaver when rainy season comes around. It’ll help keep your items (especially leather, which is easily warped) in tip-top shape, and keep you nice and dry as well. This one is a bit obvious, but easy to overlook! Swapping out the towels from your kitchen and bathroom for those made out of materials that dry quickly—like polyester or nylon—can be a big help in preventing dampness and odor when it’s muggy. Many Japanese fashion retailers (like Uniqlo) also sell lighter clothing that dries quickly, and can help keep you more comfortable in the heat and humidity that goes hand in hand with this time of year. It's also common to carry small quick-dry towels for wiping off excess sweat—which is super handy if you’re on a crowded train on a hot day! The final step is simple, and a bit of a cheat—just double-check steps one through nine. 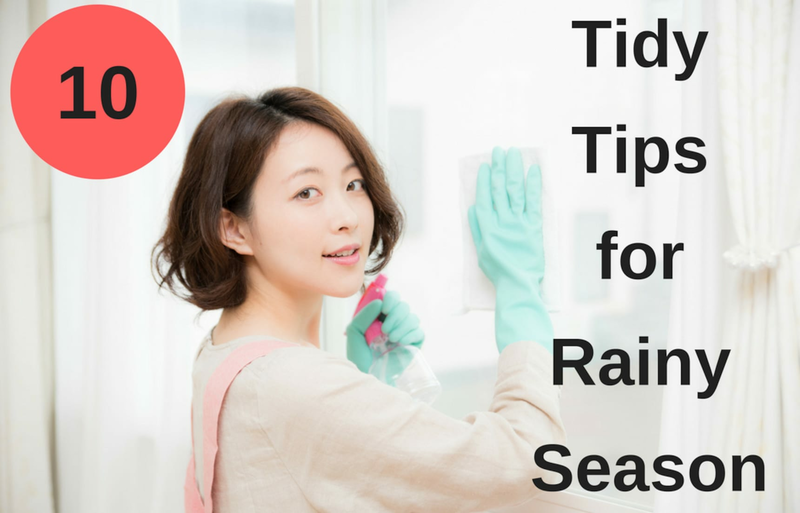 Once you’ve put the finishing touches around your home using the previous tips, you’re well on your way to enjoying a clean, manageable rainy season. A little bit of foresight and elbow grease ahead of time can save you a lot of heartbreak and hassle when the weather's at its worst.